The man leading the fight to end the scourge of paramilitarism says that even if police have to deal with terror godfathers as community gatekeepers there will be no untouchables if there is evidence against them. Anthony Harbinson, chair of the Tackling Paramilitarism Programme Board, was speaking to the News Letter on the launch of his team’s hard-hitting ‘End The Harm’ campaign around ongoing paramilitary style attacks (PSAs) across Northern Ireland. Anthony Harbinson, Chair of the Tackling Paramilitarism Taskforce, pictured at the launch of the 'Ending the Harm' campaign against paramilitary style attacks. Photo: Arthur Allison, Pacemaker Press. Some 87 people were attacked by paramilitaries in 2017/18, 22 of whom were shot and 65 assaulted. Republicans were responsible for 21 shootings and 15 assaults, with loyalists responsible for one shooting and 50 assaults. Over the last five years, 417 people have been targeted. The Tackling Paramilitary Taskforce has 38 commitments from the Northern Ireland Executive with a budget of £50m over five years backed by 24 organisations. Mr Harbinson believes it is seeing some successes in bringing down the figures. 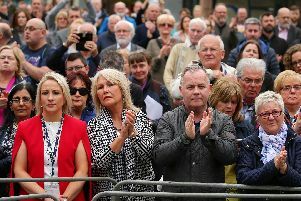 The News Letter asked him, however, if a major problem is not that paramilitary godfathers have often got legitimate roles as community group leaders or elected representatives and police find it difficult not to legitimise them, thus making it difficult for victims to report paramilitary style attacks against them? Mr Harbinson, who is also chairman of the Organised Crime Taskforce (focusing on non-paramilitary crime gangs), firmly rejected the suggestion. He said: “Supt Bobby Singleton, who heads up the Tackling Paramilitarism Task Force, has said it often and I will repeat it – there are no untouchables, there is nowhere where they will not go if they have the evidence. “So ‘no’ is the answer but there is a difference between intelligence and evidence. If people are legitimately gatekeepers or have roles within their community the police have to deal with them on one level or another. He is confident that his team has been making a difference in its first two years. “Certainly we can see that the number of paramilitary style attacks has been reducing, except for a little spike in the last week or two. In the five years to March 31 there were 417 PSAs and in 12 months to March there was 87 attacks last year, 22 shootings and 65 serious beatings. “This year we are down about a third on where we were this time last year.